Playing Around With Telemann: How Much to 'Go for Baroque'? March 12, 2018, 12:12 PM · I thought I had everything I needed to perform the Telemann viola concerto in May. I have a viola, I have a bow, I have the green-covered music. All the orchestra parts and a score can be downloaded from IMSLP. But I keep finding new things to play around with. 1. A Baroque Bow. 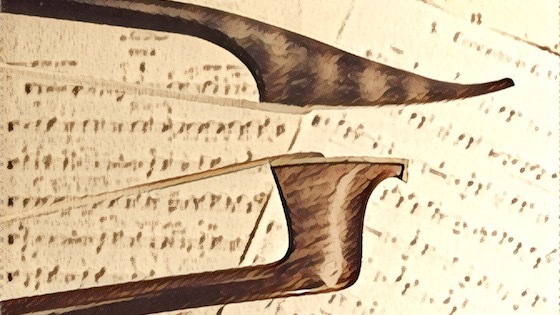 A couple of years ago, in response to the interest generated by this blog on violinist.com, I asked for and received a Baroque bow for Christmas. But after a few brief experiments, it never came out of the violin case. Was this just another one of those Christmas gifts that looks better under the tree? It was a couple weeks into learning this concerto that it occurred to me to try the Baroque bow. In the article, Laurie Niles says that "it is much easier to play string crossings, certain gestures, double stops, voicing, etc. with a Baroque bow because of its unique shape and nimble nature." The Telemann has all of these, and I when I did a one-after-another comparison between the modern and Baroque bow, I heard the tone improve with the Baroque. I was also able to easily perform a Baroque-shaped stroke, with the emphasis on the beginning of the note and a dying away at the end. Even though it's technically a violin bow, I didn't feel that I had a problem generating a robust, even sound. I didn't even think the bow needed re-hairing. This recording, by a group called the Juilliard415 ensemble, is a historically informed performance that uses Baroque instruments (not just bows) and pure gut strings. I enjoyed listening to this, especially the improvised ornaments added by the soloist, but I've made a conscious decision not to go all the way down this route. For one thing, I don't own a Baroque viola. And, I'm not interested in giving up my chin rest. 3. Wound-gut A-string. I have new Evah Pirazzi Gold strings on my viola now, and I like them. Their core is made from a modern synthetic multifilament fibre, and they are rich and strong and project well. But the A, the highest viola string, sticks out in string crossings and is sometimes too loud or too strained or both. So I put a Passione wound gut A-string on my viola two days ago. It is not particularly mellow but it is sweeter and sounds less strained than the Evah Pirazzi Gold. I'm still letting it settle in, but I think I'm going to keep it. 4. Cadenzas, Tuttis, and Editions. The cadenzas I am performing were written by Milton Katims. They are in the International Edition. I like the way they sound and they are non-trivial in terms of difficulty. I will just note that it is really hard to find recordings of these cadenzas. Everyone has their own and everyone seems to have a different one. 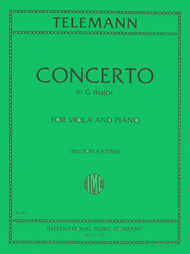 This set of recordings, which seem to have been made by a viola teacher for his students, are quite good in terms of the solo part and have the Milton Katims cadenzas, but they don't have any accompaniment, so they're not that useful for playing along. There is also disagreement about whether and how the soloist plays along with the orchestra in the Tutti sections. For example, the concerto is in one of the Suzuki viola books, and that edition has the first movement's ending Tutti written out for the soloist to play too. My edition doesn't have that; it has rests for the soloist. But my version of the 2nd movement has the soloist playing its ending Tutti along with the violins, in their octave in 5th position. Whereas the Suzuki version has it written out an octave lower for the soloist. 5. It's all in the wrist (except when it's not). I tend to like to bow from the wrist, and I have a good flexible wrist that helps me play fast and do bariolage (both of which I love to do, especially with the Baroque bow), but too much of that can get in the way of a nice, smooth, legato tone. In fact, using my wrist too much--with virtually every bow change--can lead to crunching. So, I am playing a bit more from the elbow and arm and trying to keep the tone more smooth and even. 6. Recording myself. I'm a member of several Facebook groups that focus on playing stringed instruments. More on this later, but one thing these groups have in common is recording yourself and sharing the videos in the group. I have shared a handful of videos on my blog in the past, but those have usually been performances, not "warts and all" practices, and truth be told, even though I recognize its value, recording myself has always made me nervous and uncomfortable. I hate watching myself on video; it's like a constant cringefest. But with these Facebook groups the process is getting to be a little easier. They are closed groups so the videos are only shared with people who signed up for this and are in the same boat themselves. One group has a rule of no critique or advice unless explicitly requested by the original poster. They all encourage posters to be positive and supportive of each other. So I've been doing it: recording myself almost every day and posting it to Facebook. I am getting caught up enough in the process of recording--of setting up the tripod to hold my phone, of working out the camera angles, of just deciding what section or concept I'm going to record and post today, of writing a little blurb about the video, of uploading and making sure it's in the right group and not on my general feed (ack!) --that I don't have time to be nervous anymore. I have work to do, and the nerves just have to go away and let me do it. Rehearsals start with the orchestra next week. Ready or not. March 13, 2018 at 01:30 PM · I´ve had the fortune to play it with both modern and baroque setups, it´s quite a lot of fun. I recommend you to play the fantasias too, they work marvellously on viola. March 13, 2018 at 01:32 PM · I´ve had the fortune to play it both ways, it´s quite a lot of fun. I reccomend you to play the fantasias on viola, they work marvellously on it. March 13, 2018 at 03:33 PM · Thanks for the recommendation! I will probably be looking for a new solo piece to work on after this performance is over. March 13, 2018 at 07:30 PM · How do you know what kind of Baroque bow to buy online? Even if I only spend $45 on one, I don't want to get ripped off, and I want something that will be playable (after a rehair, if necessary). Any suggestions? March 13, 2018 at 10:32 PM · Karen, congrats on this undertaking! The Telemann is the first viola concerto and is wonderful. A couple of questions- are you using a harpsichord? The printed parts, taken directly from the handwritten score, are incomplete without harpsichord to complete the figured bass. I have fully realized parts and score for performing without harpsichord, the first such edition in 300 years(!). It is completely bowed, with suggested dynamics in brackets, and my own cadenzas. There a couple of recordings on YouTube. Please contact me on Facebook if interested. March 13, 2018 at 10:38 PM · Karen, congrats on this undertaking! The Telemann is the first viola concerto and is wonderful. A couple of questions- are you using harpsichord? If not, the printed parts are incomplete without the harpsichord filling in the figured bass. I have a fully realized edition with bowings, suggested dynamics (in brackets), and cadenzas. It is the first such edition in 300 years(!). There are a couple of recordings on YouTube. If interested, please contact me on Facebook. March 14, 2018 at 12:26 AM · The 1st movt of the video sounded like the soloist was playing pretty straight rhythms but the 'back-up'group was in 9/8 There IS a difference between quarter-eighth in 9/8 and dotted quarter-eighth in 3/4....perhaps some distinction could have been made, explained.....still a lovely performance.....but as a state judge, I've always mentioned how easy it is to slip into 9/8 for this movement...which is perhaps not the composer's intent. March 14, 2018 at 02:00 AM · Sounds like you are enjoying this endeavor while also growing from it! :) You will have fun playing it with orchestra, after all this work! March 14, 2018 at 02:55 AM · In response to 98.5.150.253, I don't hear what you describe in the Juilliard recording. Both soloist and orchestra match rhythms. In baroque style, dotted rhythms were performed as double-dotted rhythms, which are closer to sextuplets than true double-dots. What the composer wrote on the page does not reflect the performance practice, nor does it show the composer's intent. It is another example of how baroque music is similar to modern jazz, where eight-notes are "swung." March 15, 2018 at 12:48 AM · Dessie, I didn't really know, I only went by what was in those articles and the ones linked to it. For example, I wanted snakewood. And then I wanted "German style" because I was playing German music with it. I've been ok with not rehairing it thus far, which would cost more than the bow itself! March 15, 2018 at 12:52 AM · Larry, we might have a a harpsichord available. Not a real one, but at least a synthesized one. And we do have someone who could play it. Are you saying the orchestra parts on IMSLP need one? I haven't heard the whole thing together yet but I was assuming it wasn't necessary. For example, this recording doesn't have a harpsichord, just strings, and I think it sounds very nice. March 15, 2018 at 01:02 AM · Fran, the Facebook groups I am referring to are (in no particular order): 1. 100 Day Practice Challenge. This group is run by Jasmine Reese and is closed until June when it will be accepting new members for another 100 Day Challenge. 2. Mind-Body Practice Tribe with Jennifer Roig-Francoli. This group is run by Jennifer and is focused on the Alexander Technique and body awareness. 3. Adult Starters violin/fiddle. This group is what it says but also includes re-starters after a long break like me, and violists, doesn't allow pros, teachers, or people under 21, and I am one of the moderators. It was started years ago by Marianne Hansen and originally came from violinist.com. 4. Adult String Player. This group is a smaller spin-off of Adult-Starters violin/fiddle, run by Lovisa Kristiansdottir, and includes all string instruments and doesn't care when you started or re-started. March 15, 2018 at 02:12 PM · Karen, it was standard practice in Baroque music to have a continuo (harpsichord and cello). It was not written in the score since the harpsichordist would read from the cello part. In the Telemann manuscript (available on IMSLP) there are a few places where the chords are represented by figured bass notations. The Bashmet recording is wonderful, but not complete. This is not "heard" until m. 13 of the second movement. You can, of course, play it without harpsichord (or realized string parts). It just depends how "baroque" (or complete harmonically) you want it to sound. FYI, the Katims edition has a few mistakes. Compare it closely to the manuscript. March 16, 2018 at 03:50 PM · I decided to look into whether we can have a synthesized harpsichord. The concert venue has a nice grand piano available but I don't know if we can get an electric in there to play the harpsichord part or not. I'm sure there are real harpsichords around here, and aficionados, but getting one of those is more than we want to take on. March 17, 2018 at 02:40 PM · So, wow, actually, I found out that the concert venue hosts a Baroque music group on weekends and has a real harpsichord available that they keep tuned and maintained. So it looks like I will probably be using one after all. Thanks for the suggestion! March 18, 2018 at 05:11 AM · Karen, thanks for the facebook pages. That's wonderful news about the harpsichord. My little group was lucky enough to find a harpsichordist willing to play the 3rd Brandenburg with us and her instrument sounded really out of tune. I tried to keep it from being a distraction, which negates the advantage of having it. BTW it was called a virginal and is supposedly portable. March 19, 2018 at 03:40 PM · Karen - you have raised a number of important issues in your interesting and inspiring saga. Here is my $0.02 on some of them. I have the Barenreiter urtext edition of the concerto. I would suggest you take a look at it to at least know what edits Katmis may have made so that you can consider whether you want them or not. With respect to strings and setup, you need to make sure that you can be heard in your venue. You probably should do a test run sometime when the venue is empty just to be sure that your setup projects adequately. With respect to baroque tuning, I would go with what the conductor wants. I recall going to a performance by a period instrument group and asking one of the folks in the chorus how they adapted to A-415. She said she was not having much trouble, but the violinist standing near her was playing out of tune, probably because he had perfect pitch. So, just a warning, plus, A-415 was not any sort of accepted standard during the baroque period, as far as I am aware. It was used a lot, but not exclusively. You really do want a harpsichord part if you can find someone to do it. I think that was fairly standard. Cadenzas are a relatively late addition to the solo concerto. I doubt cadenzas were common in Telemann's day. So, in terms of authenticity, .... But, ultimately, it is your choice. If you can possibly play it with a small baroque group sometime when you are preparing it, those folks could probably give you some good pointers. Good luck! We are all proud of what you are doing and look forward to more updates.